Monday, October 1, 2018, CLEVELAND: Cleveland Clinic is the first hospital in the country to successfully perform surgeries using the Single Port SP Robot, which inserts all surgical instruments through one small abdominal incision, improving surgical outcomes and allowing quicker patient recovery. On Friday, Cleveland Clinic surgeons used the SP Robot to perform three surgeries – two surgeries to remove cancerous prostates and one surgery to remove an enlarged prostate blocking the urinary system through the bladder. Jihad Kaouk, M.D., professor of surgery and director of the Center for Robotic and Image Guided Surgery in the Glickman Urologic and Kidney Institute at Cleveland Clinic, was the first to perform and publish on robotic single-port surgery in 2008 using standard robotic systems and coining the phrase R-LESS (robotic laparoendoscopic single site surgery). After completing and publishing the first ever clinical use for the SP robot in Europe, Dr. Kaouk and his team also performed Friday's radical prostatectomies and transvesical simple prostatectomy at Cleveland Clinic. The new purpose-built robotic SP system will allow the single port approach to be more feasible. 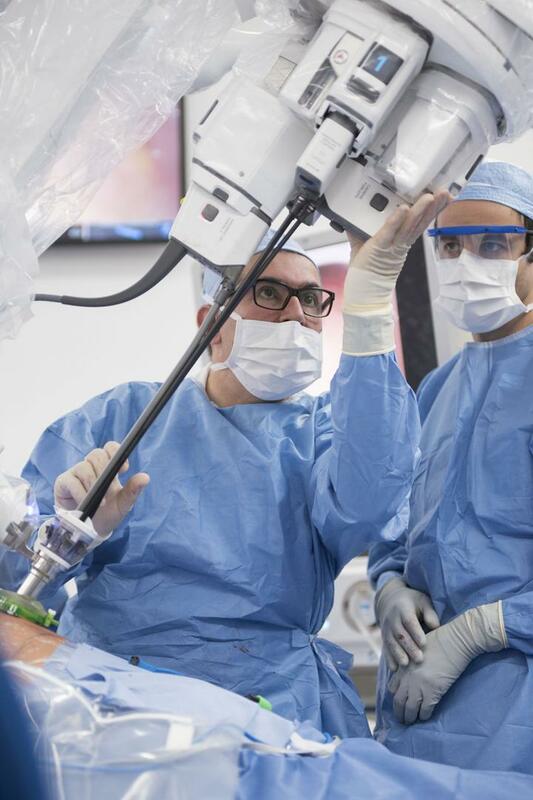 "We anticipate that this new generation of robots will allow for new and different routes of surgeries that haven't previously been possible," said Dr. Kaouk. "For example, we can now go through a patient's perineum instead of their belly to perform prostate surgery and avoid touching the bowel, or work through the retroperitoneal space to perform kidney surgery without entering the abdomen, allowing for quicker recovery time." Cleveland Clinic is the No. 1 ranked urology program in the nation, according to U.S. News and World Report. Currently the SP Robot is only FDA-approved for urologic surgeries, with plans to expand to ENT and colorectal surgeries in the near future. "We are proud to offer this surgical approach and be on the forefront of surgical innovation," said Mark A. Taylor, M.D., chairman of Surgical Operations, Cleveland Clinic. Dr. Kaouk worked with the Intuitive Inc. team of engineers to test and improve the new robotic system. Dr. Kaouk is a paid consultant, speaker or member of the advisory committee for Endocare, Inc. and Intuitive Surgical, Inc.